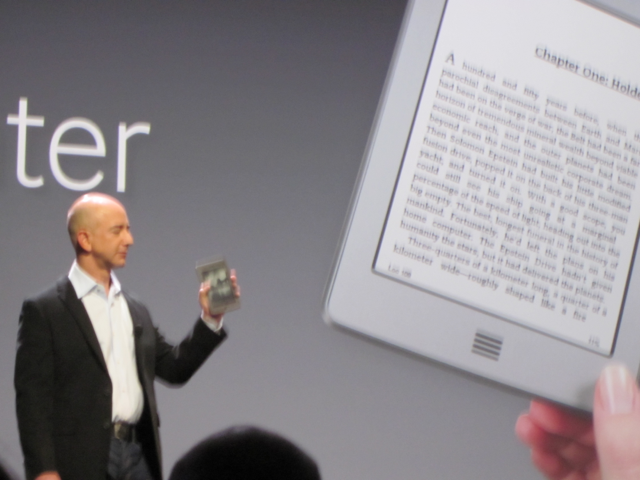 Emily Mah: Jeff Bezos is reading Leviathan Wakes, and so should you! Jeff Bezos is reading Leviathan Wakes, and so should you! And there, on the screen behind him is a Kindle, displaying chapter one of Leviathan Wakes (The Expanse) . The author of this book is James SA Corey, who doesn't actually exist. This is the pen name for Daniel Abraham and Ty Franck. I introduced these guys to each other. Daniel and I were in the same writer's group for years, and Ty and I met at a science fiction convention in Los Angeles. Ty came to visit me in New Mexico, met the rest of my writer's group, and wrote an rpg for them that they loved so much that Daniel asked Ty to cowrite a novel based in the game with him. And yes, the book is good too. I haven't read the published version, but the rough draft was better than a lot of what you'll find out there. Cool! This book is definitely on my to-read list. And it's so cool that you introduced them to each other. You seem to know so many people. I've just finished reading A Dance With Dragons which was good as far as it went, but left me hanging (again!) I don't know -- you look at epic fantasies like these, with characters dying off and new characters coming to the fore, and you wonder how the author can ever bring the series to any kind of conclusion. Maybe they can't, maybe they can only stop writing. George does have a planned ending to his saga. I do not know it, but I know people who know it. You've now read past any point that I've seen in George's work. Shoot. I was really hoping the universe centered around me. Melanie, Ice and Fire does have an ending. I can attest to this fact. And he could tell us, but then he'd have to kill us, and then he'd have to go to prison and George would NOT be happy.